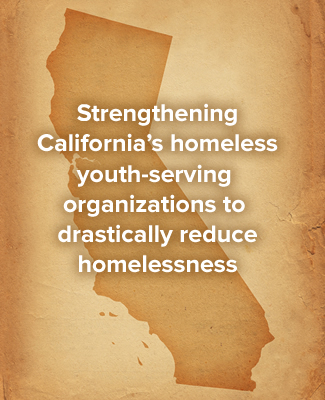 During 2010-11, the Homeless Youth Capacity Building Project awarded a total of $600,000 of financial assistance grants to 41 organizations across seven California counties. These organizations used their grants to strengthen the capacity of their organizations through projects that fell into one or more of the following capacity building categories: Collaboration and community engagement, evaluation of effectiveness, leadership development, organizational development and program development. Examples of funded projects include: the creation of a strategic plan; the creation of a fundraising plan; the purchase of software; the design of a database; the creation of a policies and procedures manual; the design of an evaluation plan; the training of staff and the separation from fiscal sponsorship to organizational independence.